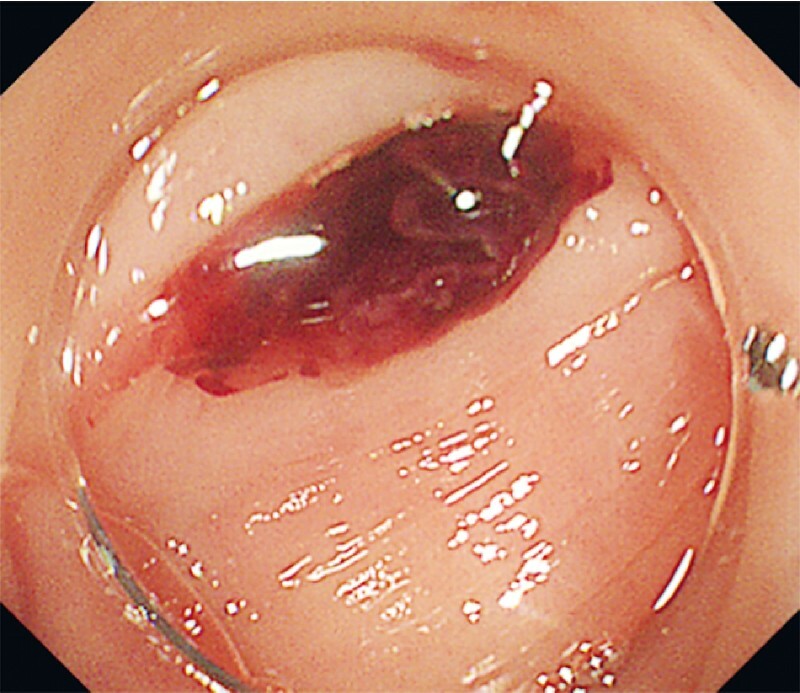 Low completion rate of endoscopic treatment for colon diverticular bleeding remains troublesome because of the difficulty in determining the responsible diverticulum after spontaneous cessation of bleeding. Extravasation, observed on contrast-enhanced computed tomography (CECT), is an important factor in identifying a bleeding diverticulum. However, the detection rate using colonoscopy is not satisfactory, with a ≤ 60 % chance of lesion detection   because colonoscopy does not provide as much precise positional information as CT. The “step-clipping” method uses endoclips to create artificial indicators in the colon , formulating a positional relationship between the responsible diverticulum and each clip. Combination of this technique with computed tomographic colonography (CTC), which is recommended for neoplastic lesions , may identify a silent lesion ([Video 1]). Video 1 Seven marking clips placed on the colon serve as artificial indicators. Computed tomographic colonography provides 3-dimensional information about the relationship of the responsible lesion and each clip. A 58-year-old man was admitted with massive hematochezia. Five previous colonoscopic examinations during four previous consecutive admissions failed to detect the responsible lesion. Extravasation was detected from one of the numerous diverticula in the ascending colon on CECT conducted upon admission ([Fig. 1]). However, subsequent colonoscopy found no active bleeding. After a minimal search, we placed seven marking clips, 2 inches apart, from the ascending colon to the transverse colon ([Fig. 2], “step-clipping” method), and performed unenhanced CT. Fig. 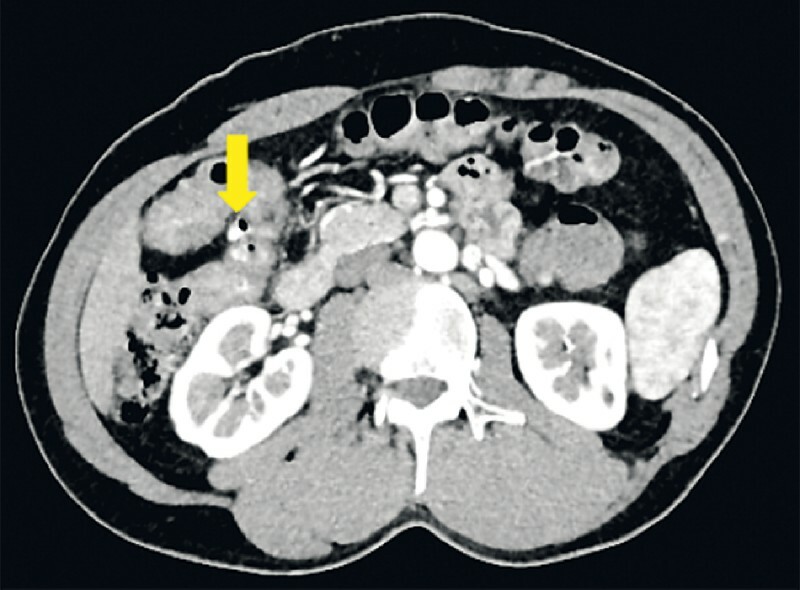 1 Contrast-enhanced computed tomography image taken on admission day showing extravasation from one of the diverticula in the ascending colon (yellow arrow). Fig. 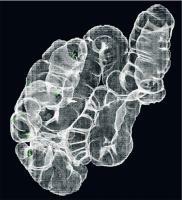 2 Seven clips were placed from the ascending colon to the transverse colon, 2 inches apart. Colonography schematically represents the position of the seven clips. The responsible diverticulum, identified on initial CECT, was determined on the unenhanced CT, and then marked digitally ([Fig. 3 a]). Synchronized CTC was performed, which revealed that the digital mark was placed opposite the 6th clip and beyond a fold in front of it ([Fig. 3 b]). Based on this evaluation, colonoscopy successfully identified the responsible diverticulum ([Fig. 4]), resulting in endoscopic band ligation. Fig. 3 Identification of the responsible diverticulum. a Unenhanced computed tomography after “step-clipping.” The responsible diverticulum, identified on initial contrast-enhanced computed tomography, was determined and marked digitally (red-colored circle). 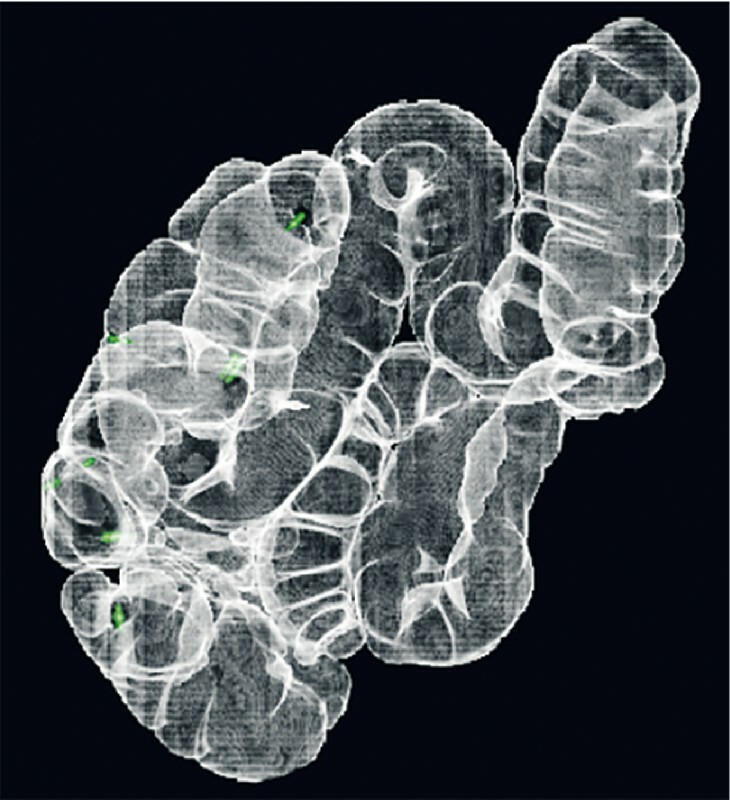 b Computed tomographic colonography showed a synchronously marked diverticulum opposite the 6th clip and beyond a fold in front of it. Fig. 4 Colonoscopy successfully identified the responsible diverticulum with a clot on the orifice of the diverticulum. Information regarding the haustra and circumferential assessment are difficult to acquire from conventional CT axial imaging. CTC can overcome these limitations and is an appropriate simulation before colonoscopy. Clip marking on CTC provides 3-dimensional relationships with the responsible diverticulum, thus demonstrating its clinical feasibility.